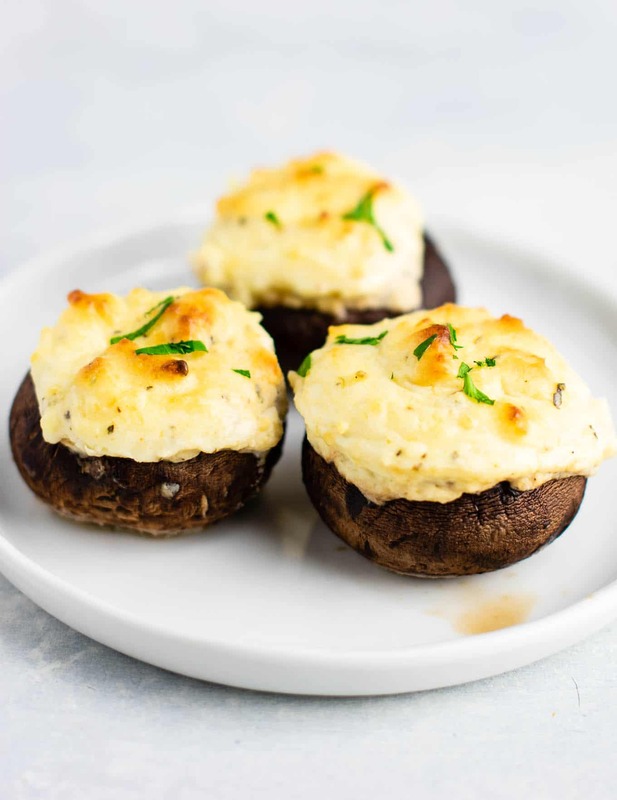 Stuffed portobello mushrooms are everything to a mushroom lover. 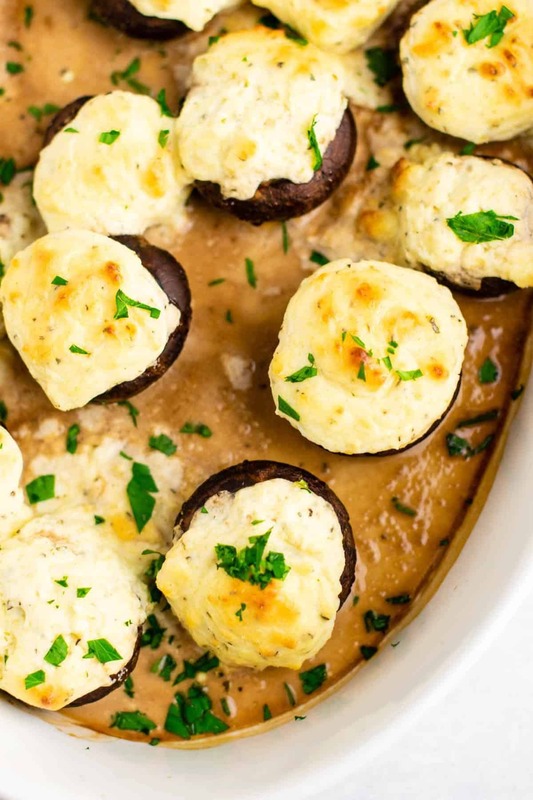 They are one of the most delicious portobello mushroom recipes. Perfect if you are planning a New Year’s Eve party! 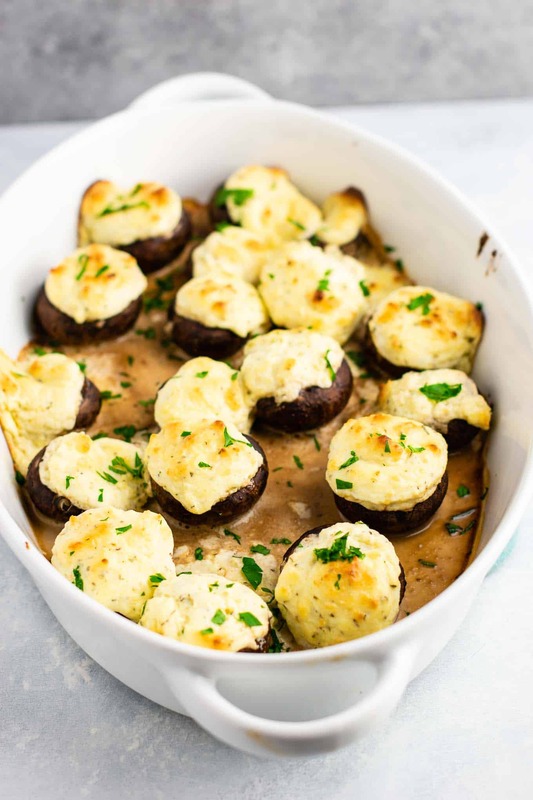 I am most definitely a mushroom lover, and that’s why you’ll find many mushroom recipes on my blog. From garlic butter mushrooms, to vegetarian bolognese, portobello fajitas, and more. 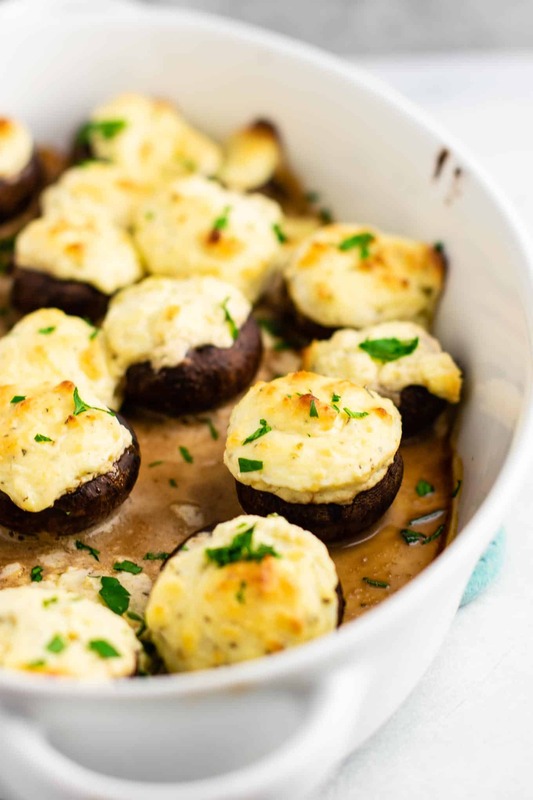 Mushrooms are so versatile and fun to cook with! That’s it! These are so simple and pack a huge flavor punch. Every bite is melt in your mouth delicious. First, get your cream cheese out of the fridge and let it start to soften. 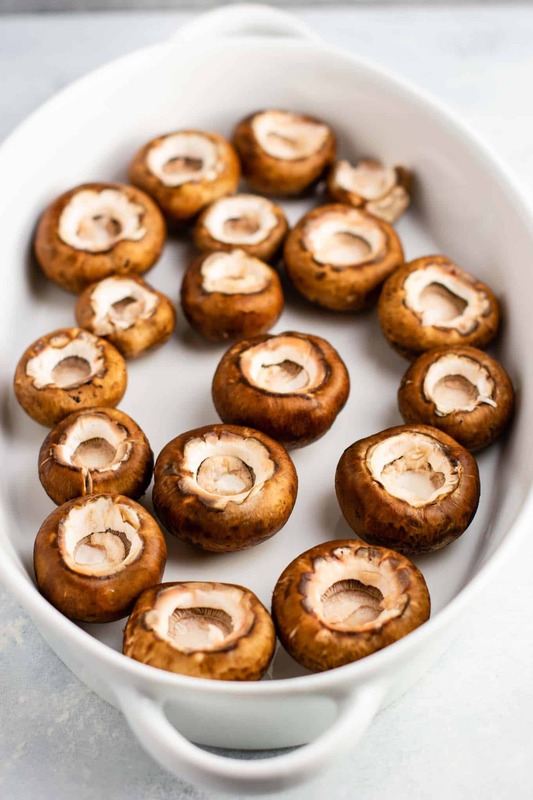 Get your mushrooms ready for stuffing by rinsing them clean, then removing the stems. Pat mushrooms dry to remove any excess water and remaining dirt. Place them in a baking dish mushroom caps side down. In a bowl, beat together the softened cream cheese, sour cream, parmesan cheese, oregano, garlic powder, onion powder, salt, and pepper until well combined. Stuff the mushrooms as full as you can get them. They should look like they have hats by the time you’re done with them! The more of the stem you can get out, the easier the stuffing part will be. 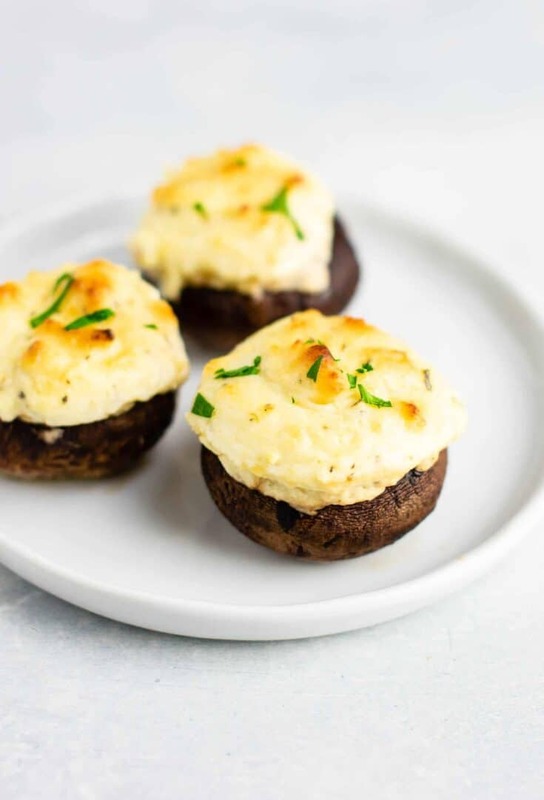 We’re going for super stuffed portobello mushrooms here. That filling is where it’s AT. Pop those babies in the oven and bake until the tops get all browned and delicious like this. Sprinkle on some fresh parsley for a fun little pop of flavor and color! 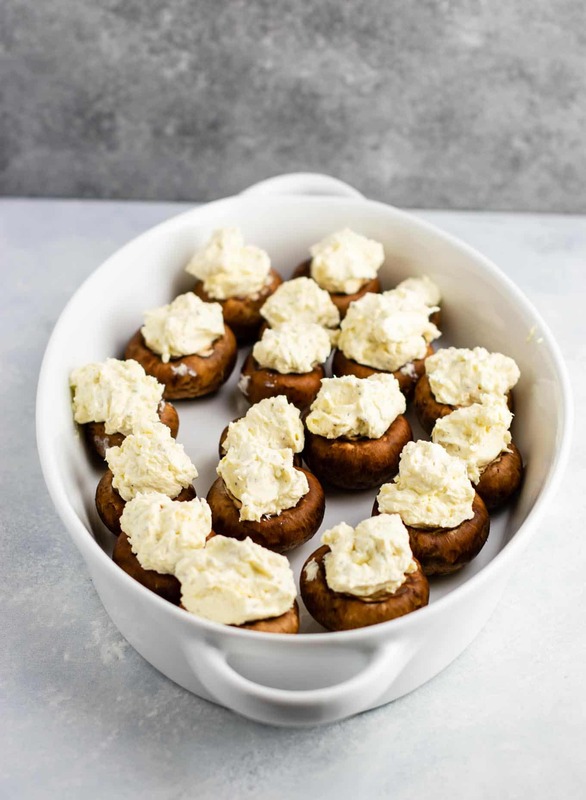 These are a perfect appetizer that are sure to impress. Hungry for more? Here are some more delicious vegetarian appetizer recipes! 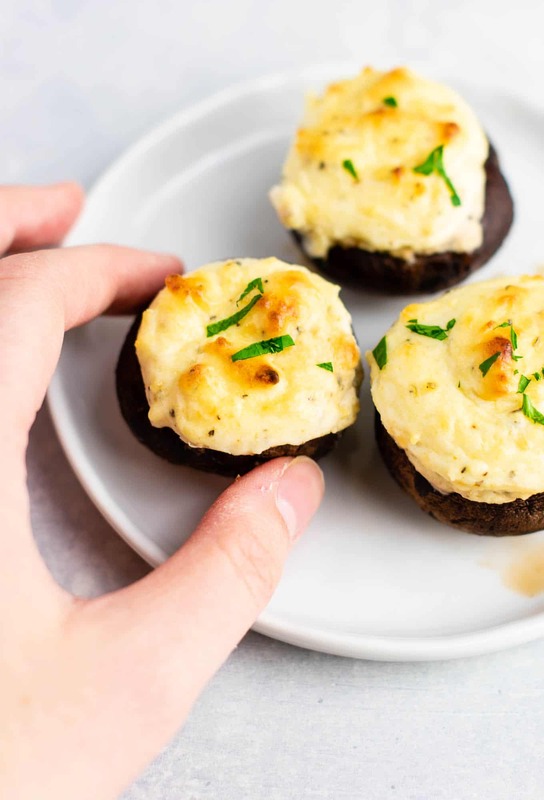 Easy stuffed portobello mushrooms - an easy, low carb, vegetarian appetizer that's sure to impress! Do they need to be in a baking dish. What’s that sauce they are in? Gonna try to make this they look sooooo good. You can make them on a baking sheet as well! I just would recommend one with raised edges. 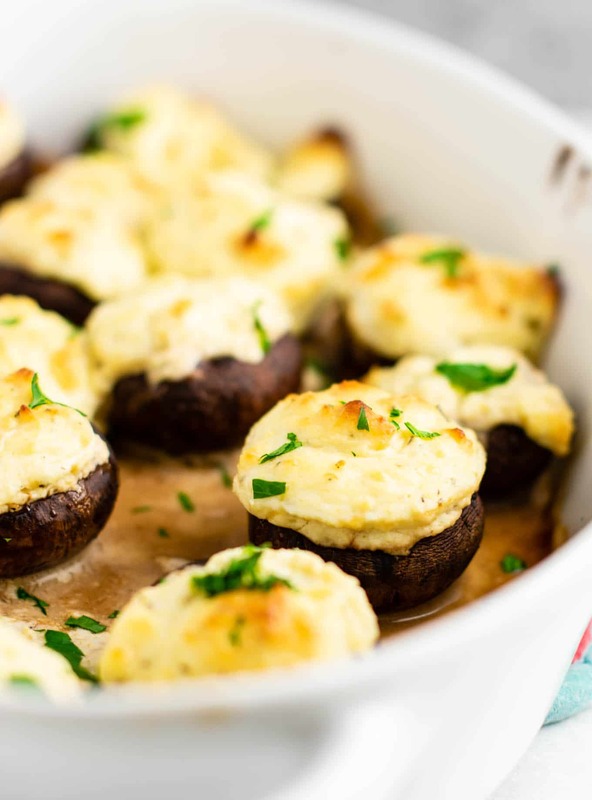 No sauce needed – what you’re seeing is just the liquid that the mushrooms emit while cooking! Hope you enjoy the recipe! How far ahead of baking can I prep them?